ClearOS Community 6.5.0 Beta 1 has arrived! Along with the usual round of bug fixes and enhancements, this release introduces Marketplace enhancements, a Network Detail Report, an Administrators app,Official Amazon EC2 Support, a Software RAID Manager, Mail Archive,UPnP Support, an updated Web Server app, as well as new reporting features. 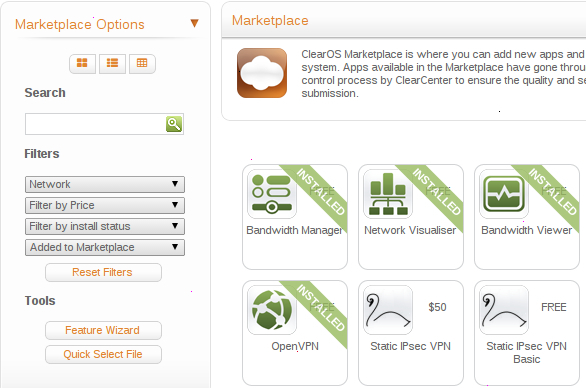 Virtual Machine and Cloud Images are not available for this beta. Public pages (e.g. User Profile) should be filtered out. Some apps will not work independently. For example, the PPTP Server requires access to the Account Manager. We'll clean those issues up. button… a wee bit confusing!